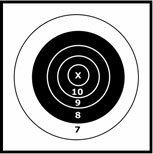 I entered the world of competitive rifle shooting late in life — at about 47 years of age (I’m 52 years old now / May 2004). Most of my shooting career had revolved around defensive pistol shooting (International Defensive Pistol Association / IDPA). Once I started shooting IDPA events, I purchased my own Dillon 550B reloading outfit and dies, and over the next several years reloaded thousands of rounds of 9mm, .38, and .45 caliber ammunition. During my time with IDPA I became an NRA Certified Pistol Instructor, NRA Certified Range Safety Officer, and an IDPA Certified Safety Officer. In 1999, I took 1st place at the IDPA Midwest Regional Match in Custom Defensive Pistol / 1911 Pistol / Marksman Class. In October 2001, I took my father to watch a Black Powder Cartridge Silhouette Match hosted by the Miami (Ohio) BPCR Club at the Walter Cline Range (National Muzzleloading Rifle Association) in Friendship, Indiana, and immediately became hooked on the sport of BPCR Silhouette. It was at that event that I first met George Liotta. As it turned out, George and I both lived in the western suburbs of Chicago and were only about 15 miles apart. Since that fateful day, George has been a friend, shooting partner, and mentor. George’s extensive experience in all aspects of the shooting sports, and his devotion to Black Powder Cartridge events in particular, enabled me to learn the ins and outs of the sport much more quickly than I would have ever been able to do on my own. George and I continue to push each other to develop better methods of casting match quality bullets, formulating effective lube recipes, and perfecting the skills necessary to excel at Long Range BPCR, the most challenging shooting sport I have ever tried. Our goal in developing this web site was to provide other BPCR shooters (especially those shooting in a Long Range BPCR match for the first time) with a wealth of knowledge that we were unable to find anywhere else on the Internet. I hope that you will find the information offered here to be useful and I wish you the best of luck in your competitive endeavors!